Under contemporary capitalism the extraction of value from the built environment has escalated, working in tandem with other urban processes to lay the foundations for the exploitative processes of gentrification world-wide. Global gentrifications: Uneven development and displacement critically assesses and tests the meaning and significance of gentrification in places outside the ‘usual suspects’ of the Global North. 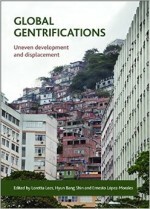 Informed by a rich array of case studies from cities in Asia, Latin America, Africa, Southern Europe, and beyond, the book (re)discovers the important generalities and geographical specificities associated with the uneven process of gentrification globally. It highlights intensifying global struggles over urban space and underlines gentrification as a growing and important battleground in the contemporary world. The book will be of value to students and academics, policy makers, planners and community organisations.